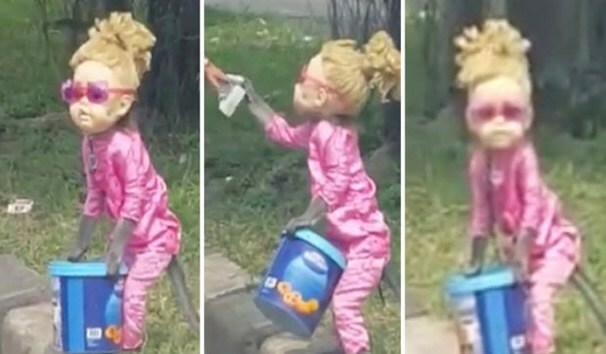 A video of a monkey posing as a human being in Bogor, Indonesia, wearing a suffocating mask as it asked drivers for money at the side of the road has evoked mixed reactions. The monkey was spotted wearing a giant female doll mask complete with pony-tailed blonde hair and sunglasses. He held a blue bucket to collect money, the monkey stood and looked around at the drivers, waiting for anyone who might be willing to give him some change he would then approach the person and collect the money. They’re chained by the neck and videos online show them being yanked cruelly whilst performing for the public. Topeng Monyet was banned in Indonesia’s capital city Jakarta after a campaign in 2013. Many of the monkeys were unable to return to the forests that they were taken from because of severe physical and mental trauma. However, the practice continues throughout Indonesia.